Walachian prince Michael the Brave is the first to have accomplished the Union of Romanians under his scepter in 1600, even if for a short period only. His seal as prince of Walachia, Transylvania and Moldavia can be deemed to be the first coat of arms of Romania, resembling well the nowadays state coat also. 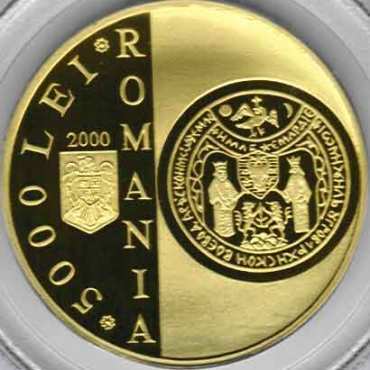 The seal is pictured on the anniversary golden 5000 lei coin of 2000 celebrating 400 years since the first Union of the Romanians. In October 1599 Michael overthrown Transylvanian prince Andrew Báthory through the battle of Şelimbăr, near Sibiu, and on November 1st Michael entered triumphantly in Alba Iulia, therefore named afterwards the City of the First Union. In May 1600 Michael entered Moldavia, the capital city of Suceava and the famous fortress of Neamţ opening voluntarily their gates. During June, July and August 1600 Michael the Brave effectively ruled all three Romanian Principalities, thus accomplishing the first Great Union of Romanians. 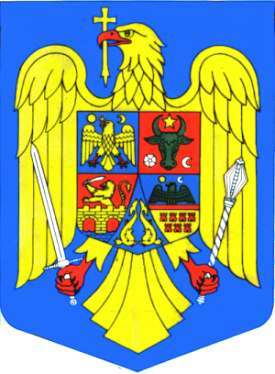 The seal comprises the coats of arms of the three Romanian principalities: in the middle, on a shield hatched horizontally (blue) the Moldavian urus, above Walachian eagle between sun and moon holding cross in beak, below Transylvanian coat of arms: two meeting, standing lions supporting a sword, treading on seven mountains. 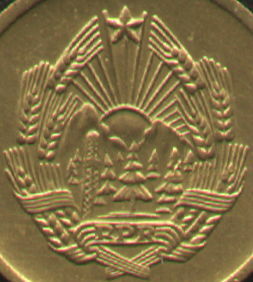 The Moldavian shield is held by two crowned characters. 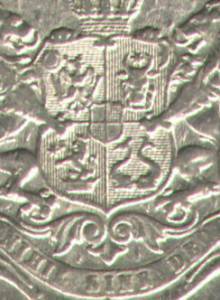 There are two inscriptions on the seal. First, circular, in Cyrillic, seems to be IO MIHAILI UGROVLAHISCOI VOEVOD ARDILSCOI MOLD ZEMLI, meaning something like IO MICHAEL WALACHIAN VOIVOD TRANSYLVANIAN MOLD LAND. Second, placed along a circular arc separating the Walachian coat from the rest of the heraldic composition, NML BJE MLRDIE, could be translated THROUGH THE VERY GRACE OF GOD. The Romanian state is known as such since 1859 when the principalities of Moldavia and Walachia joined under the rule of Alexandru Ioan Cuza (1859-1866), known as "Prince of the Union" up to present days. The Romanians had joined and as consequence the coats of arms were joined too on the same shield. But not for the first time. Actually, the united coats were commonly used by Romanian princes, princely families and state institutions (like the Church on cult books) from the first half of the 18th century. No surprise, since many princes reigned successively in both principalities; it was not impossible for a princely family to reign over Moldavia and Walachia at the same time. Usually the coat depicted the urus first (right) and the eagle second (left). There are even heraldic representations of all three principalities brought together: Transylvania, Moldavia and Walachia. The first such coat of arms was used towards the end of the 16th century by Sigismund Báthory, prince of Transylvania that asserted to rule as prince of Moldavia and Walachia too. During Alexandru Ioan Cuza the coat of arms was not stabile, many strong variations showed. The urus and the eagle (aquila) shared the shield divided vertically into two regions. On other variant the shield was quartered, each symbol filling a diagonal (that is two quarters). The shield was supported by two affronted dolphins or there were no supporters at all. The affronted dolphins were a heraldic symbol well known to Romanian heraldry - the coat of arms of Iaşi (known also as Jassy by foreigners, capital of Moldavia) was two affronted dolphins. They were supposed to mean, I guess, that Moldavia was a Danubian and maritime principality. If Moldavians had good reasons to use dolphins as arms, the more has Romania had to keep them for both provinces. (The dolphins reappear again latter.) The shield was stamped by a crown and the whole composition lay under a battle tent also stamped by a crown. At the beginning of the Carol I (of the German Hohenzollern family) reign, the Romanian coat of arms looked as seen in the picture below. What must be observed about the coat, besides what comes evident out of the picture itself, is that each principality should have had its own pair of astral elements but does not. Instead of having their own, they share an only pair (sun and moon), placed in the first quarter (the sun) and the second quarter (the moon, but waxing, not waning like it should on the Moldavian coat). In the heart (everywhere) lies a smaller shield - the Hohenzollern family arms. That is a quartered shield with silver on the first diagonal (first and fourth quarters) and color black on the second one (second and third quarters). The right supporter (in heraldry we report to the left or right of the shield, coat or representation, not the left or right of the beholder) was a woman holding a curved Dacian sword standing for province Dacia, and the left supporter was a rampant (reguardant) lion. Below the shield, on a ribbon, stood the Latin sentence NIHIL SINE DEO (NOTHING WITHOUT GOD) belonging to the Hohenzollern family. This coat was soon replaced by a more evolved representation, in 1872. Every quarter suffered amendments and two rampant lions were supporters now. Inside the first quarter the eagle looked left, now looks right; holds now cross in its beak, sword in the right and sceptre in the left talons. The second abode holds a very bearded urus, because it is thought already to be a wisent. It is clear to see the main urus (old, attested, representation) and around the head hairy beard. Well, the people that created the ensign didn't like to affect the known representation. Incapable to explain to them and to others how come such a hairy animal as the wisent (so it was thought to be) looks so plain, they made a compromise and wrapped the urus in hair. Accidentally, now a six ray star lies between the urus horns instead of a five ray one. The third quarter hosts a rampant crowned lion, emerging from a crown and facing right toward a six ray star. This is the coat of arms of Oltenia, western province of Walachia. Although an old armorial compendium, actually a copy made after a work Ulric von Richental compiled between 1420 and 1430, displayed a crowned lion as coat of arms of Oltenia, no such representation is known to have been used by Romanians until 1872. The last quarter is charged with two affronted dolphins. As we saw, the dolphins were Moldavian arms. They stood now for the sea territories Moldavia held at the Black Sea shore. As Moldavian arms, the dolphins can be seen even today on some lighting poles in the Moldavian capital Iaşi (known as Jassy also), poles manufactured in the 19th century. Nowadays the coat of arms of the Municipium of (akin to English municipality) Iaşi reverted to another old coat of it, the horse and fortress. 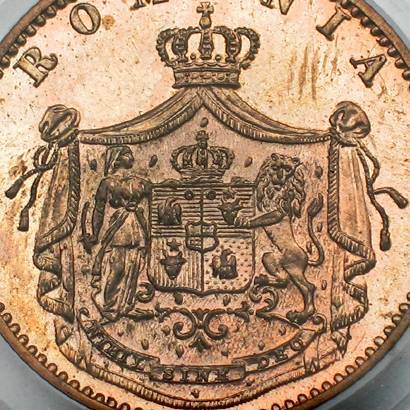 In short let us conclude that the Romanian coat of arms in 1872 comprised the coat of arms of the two Romanian provinces and of the two dependencies they had. Romania became independent in 1877 and was proclaimed kingdom in 1881, when Carol I was crowned with a steel crown made of the steel of captured Turkish cannons. The Russian ally, as the war ended, ripped from Romania the Moldavian shoreline. They pretended to make a fair trade, giving in exchange to Romania the territory of Dobrogea, the Danube Delta and the Isle of the Serpents at the Black Sea, all obtained in 1878 from the Ottoman Empire as amends of war. These territories, at the time underpopulated and mostly barren, had been lost to the Turks by Romanian princes in the Middle Age despite their opposition. On the other hand, what Russia got manu military from Romania were territories ripped from Moldavia in 1812 along the entire eastern half of the principality. The peace treaty following the Crimean War in 1856 returned Moldavia some of lost parts, the south of them. 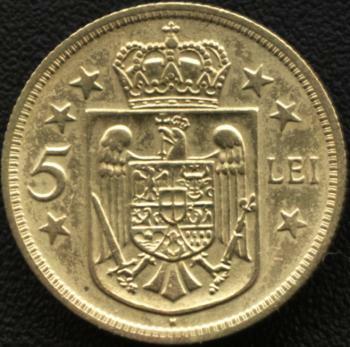 Due to the facts shown, the fourth quarter of the Romanian coat of arms did not change, the signification only changed. The dolphins stood now for Dobrogea, the Danube Delta and the Isle of the Serpents at sea. Also the heraldic crowns that stamped the shield and the tent of the Romanian coat of arms looked more and more alike the crown born by the now King Carol I. The Moldavian origin of the Romanian seashore territories coat of arms is indisputable. The oldest testimony of it can be found in Descriptio Moldaviae, book of Dimitrie Cantemir, renowned scholar and prince of Moldavia (1710-1711). The next citation is taken from the fourth chapter, from the paragraph entitled Basarabia, yore the third and chief part of Moldavia : "The fortress of Suceava only holds amidst its wall a large stone in which seven towers are carved, covered by a reigning crown, held by two lions. Besides this at the towers' foundation a stone with two scaly fish standing with their heads down and tails risen is seen, and beneath these the head of a wisent, between the horns of which a six ray star lies". In 1918 three territories populated since ancient times by Romanians joined the MotherLand: Transylvania, Bucovina (ripped by Austria in 1775 from the principality of Moldavia) and Basarabia (eastern half of Moldavia ripped by Russia in 1812 and become gubernia). The heraldic update came in June 1921. Three variants were then appointed. We used the smallest and most concise one for illustration (below) the medium size one. The medium had the crowned shield (comprising the usual Roman aquila) held by two lions, other adornments being also present. The full coat had the medium version placed under a crowned battle tent. Regarding the first two quarters we observe that each got back its pair of astral elements. Also, the weapons were lend by the Walachian eagle to the other that holds the shield. The star on the Moldavian coat was restored to its historical five ray shape. Besides we can see the confusion with the wisent complete. The last wisent hunted in Romania was killed in 1790, somehow recently, and the urus couldn't compete it seems. 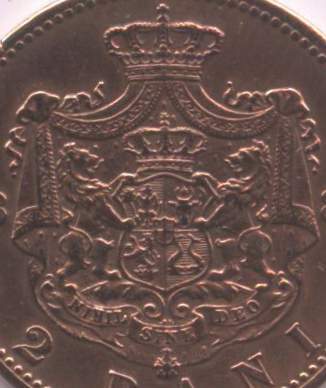 On the coat of arms of Bucovina as Austrian duchy was represented also a wisent, on the one of Basarabia as Russian gubernia a plain ox or bull head, so that its fate was to be mistaken it seems. The Soviet Army occupying Romania in 1944 brought up quickly a communist party that developed out of almost nothing and forced a regime shift. On December 30th 1947 was proclaimed the Romanian People's Republic that had a new coat of arms in 1948 already. The picture you see is the version used from 1953 on, but we did not post two since the only difference is the red star atop that was included later to conform better with the Soviet model all communist coats of arms followed all over the world. Try the links below and see for yourself please. The coat was somehow naive and not related by anything to Romanian heraldry. The thing at right is an oil rig, if you were wandering, and the water below stands for Danube (longest river in Europe that flows through Romania). On the ribbon you see R.P.R. - standing for Republica Populară Română. Since 1965 on the ribbon had Republica Socialistă România on it (Socialist Republic of Romania). December 1989 meant end to communism in Romania. A new coat of arms retrieved the heraldic tradition, amending the 1921 coat model. In the next paragraph you can read how the Romanian law states and describes the coat of arms of the country. Read only if you are interest in earnest manner of Romanian heraldry. “The coat of arms of Romania symbolizes the Romanian state, national, sovereign and independent, unitary and indivisible, and it is made of two overlaid shields: the large shield and the small shield. The large shield, on blue, has a golden aquila the head turned right, beak and talons red, holding in its beak a golden orthodox cross, in the right talon a sword and in the left talon a mace. I have one small objection on the present Romanian coat of arms. The Moldavian urus should have looked fiercer, instead it has a rather sociable countenance. That's because the lower lip is seen (but not on any of the medieval representations). The traditional urus had a more stately, charging like position. The new coat of arms was elaborated by specialists supervised by Mrs Maria Dogaru. The same Maria Dogaru is the author, along Gheorghe Vrabie, of the coat of arms of the Republic of Moldova that you can see on a small picture below. Objection: the star should have been a five rayed one; instead, it has eight rays. Thanks for reading. If you find some of the information available on our site useful and employ it inside a paper, article, web page or whatever else, please send us a note at the following e-mail adress: romaniancoins@yahoo.co.uk.